Millions of years ago, the Yucatan peninsula was below sea level and formed the bed of a shallow ocean. Fish shellfish and coral thrived in this environment, and when they died their bones and shells fell to the sea floor. The calcium from these formed a calcium carbonate (CaCO3) sludge. As the depth of this layer of sludge thickened, the increasing pressure solidified the calcium carbonate into a porous limestone rock. During subsequent ice ages the sea level fell and the peninsula was exposed, forming dry land covered in heavy vegetation. Rain falling on the land would percolate through the decaying vegetation and the porous limestone, and then flow horizontally to the sea. The rainwater dissolved carbon dioxide (CO2) from the atmosphere and produced by decaying vegetation, forming carbonic acid (H2CO3). This carbonic acid solution dissolved the limestone, sometimes creating vertical shafts from the surface, and sometimes creating horizontal passages towards the ocean. 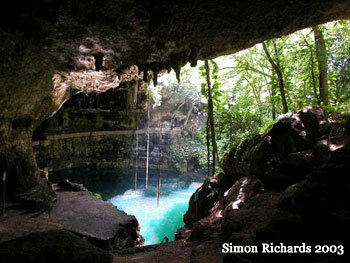 Most of the horizontal cave development is believed to have happened close to the water level.